When major labels started buying up alternative rockers by the bushel in the 1990s, few would’ve expected that two who’d hang around the longest would be The Flaming Lips and Built To Spill—and both still on the same label, Warner Bros. The two bands have remained successful in large part because they draw crowds when they play live, though their approaches are different. A Flaming Lips show is like a psychedelic circus, while Built To Spill has always been about three-to-five ordinary-looking dudes on a stage, playing loud and long. A modest, hard-working guitar hero, Built To Spill frontman Doug Martsch has been known to fuss with songs off and on for years, trying to get a recording he likes (or can at least tolerate). In concert though, Martsch frequently uses his own work as a showcase for jammy interludes and rowdy instrumental breakdowns. He rarely says much to the audience, and he dresses like the scruffy middle-aged family man that he actually is offstage. But when Martsch steps up to the microphone and his head starts to bobble—like some bearded, balding Muppet—he becomes surprisingly expressive. And all the while he’s wiggling and throttling his guitar, producing sounds that are heavenly, atonal, and ferocious. Martsch formed Built To Spill after playing guitar in Treepeople, an Idaho band that moved to Seattle early in the grunge boom but proved to be a little too quirky to develop more than a small-but-fervent cult. Retreating to Idaho and taking the lead with his new group, Martsch recorded a handful of singles and two indie-label albums, searching for a style that would be inspired by—but not derivative of—Dinosaur Jr., Neil Young, Pavement, The Smiths, and Meat Puppets. 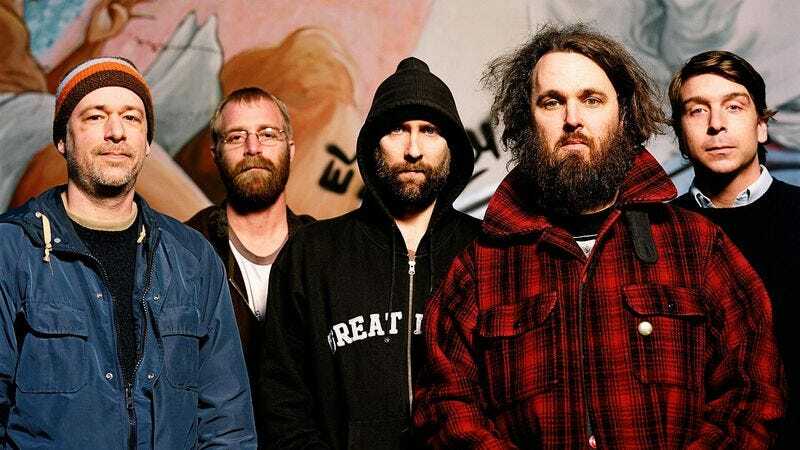 The early Built To Spill was modestly epic, like so many other lo-fi 1990s bands that gravitated to the form of classic rock but didn’t have the technology or the inclination to replicate it. When Warner Bros. came calling, Martsch took advantage of the label’s money and “hands off” promises and recorded 1997’s Perfect From Now On, a set of winding, multi-part songs about morality and meaning that rivaled that year’s OK Computer in musical and thematic ambition. While other indie bands at the time (Guided By Voices, for one) were treating albums like sketchbooks, filled with half-formed ideas that retained their original spontaneity, Built To Spill was working in the tradition of prog-rockers like Yes and Emerson, Lake & Palmer, who worked overtime to fit fragments into suites. At the same time, Martsch contemplated divinity and decency, affirming the value of having at least some kind of code of personal behavior by singing, “God is whoever you perform for.” Built To Spill followed Perfect From Now On two years later with Keep It Like A Secret, which retained the complex arrangements and thoughtful lyrics but tightened the overall package, showcasing catchy songs that remain some of the band’s most beloved. Two weeks ago saw the release of Untethered Moon, Built To Spill’s eighth LP overall and its fourth since Keep It Like A Secret. Over the past 15 years, Martsch has continued to tinker with the band’s sound, working with simpatico guitarists like Brett Netson and Jim Roth, and even adding an entirely new rhythm section after his longtime drummer Scott Plouf and bassist Brett Nelson moved on. But mostly he seems content to be a respected, beloved alt-rock veteran: the kind who plays the late afternoon slots at festivals instead of headlining, and who hits the same circuit of mid-sized rock clubs every couple of years. For decades now, Built To Spill has been blasting arena-scaled music to packed houses at smaller venues, and has continued to find virtue in a well-turned phrase and a well-bent guitar string. It’s hard to boil Built To Spill down to an hour of music, since so many of its best songs push well past the five-minute mark. (Sorry, “Kicked It In The Sun,” “Some,” “Nowhere Nothin’ Fuckup,” “Conventional Wisdom,” and “When I’m Blind”… no room for any of you.) But the mix below represents much of what’s great about the band, from the taut toe-tappers to the wailing epics. At a typical Built To Spill show, some combination of most of these songs would make up the setlist, which means for the uninitiated this Power Hour makes a great preparation for what should be the ultimate goal of seeing Built To Spill live. The first song on Keep It Like A Secret works even better as the first song on Built To Spill’s 2000 album Live, because it throws the audience right into the deep end, with a fast-building, beautifully cascading guitar riff and some amusingly offbeat Martsch lines about the nature of some mysterious “plan.” (It keeps coming up, it means nothing, and it won’t accomplish anything if it’s not implemented.) The live version extends the multi-instrumental interplay of the studio version, releasing the tension of the noisy mid-song freakout more gradually. “The Plan” is a hooky number with a lot of moving parts, but like a lot of Built To Spill’s music it ends up being a thoughtfully mapped-out trip, leading fans down a rocky path, by beautiful scenery, to a place of quiet contemplation. After Keep It Like A Secret and Live, the band continued its brief one-album-a-year run with 2001’s disappointing Ancient Melodies Of The Future, and then took a hiatus while Martsch recorded a perfectly pleasant but largely inconsequential blues-folk solo album. By the time Built To Spill returned with 2006’s You In Reverse, it’d been seven years since it had recorded and released an unquestionably great LP. In the interim, alternative music had gone through a turnover, with the offbeat indie groups and muscular grunge acts of the 1990s giving way to neo-garage and the wiry, post-punk-inspired New York scene of The Strokes and Interpol—not to mention a mini-wave of popular bands like Death Cab For Cutie, Modest Mouse, My Morning Jacket, and The Shins who bore a distinct Built To Spill influence. You In Reverse quickly reestablished Martsch’s relevance by kicking off with the nearly nine-minute sprint “Goin’ Against Your Mind,” a rager that’s as spirited and inventive as anything the younger generation was coming up with at the time. From the soupy breakdown in the middle—which resolves into tight, thrilling riffing—to Martsch’s little joke about how he once thought he saw a UFO that turned out to be “just God,” this song is a powerhouse. Built To Spill often opens shows with “Goin’ Against Your Mind,” which is a cocky move. When a band starts with something this fast and this long, with such dreamy soloing and such a door-slamming finish, it’s a way of declaring that it has plenty more songs just as great, loaded and ready to go. Here’s an example of a Built To Spill song that seems simple, but that has dense layers that the band gradually peels off and examines individually. The 2009 album There Is No Enemy is one of the more polished in the BTS discography, and in that spirit “Planting Seeds” takes what could’ve been a soft mid-tempo country-rock track and beefs it up by weaving together multiple guitar sounds—shimmering, twangy, gliding—and using each as the starting point for a different bridge or change, gradually expanding what the song is. (Planting seeds, indeed.) Meanwhile, Martsch’s lyrics work up a good lather, railing against the cynics and the exploiters who try to make a buck off of anything beautiful. A perennial Built To Spill favorite—recorded for a 1994 single, re-recorded for the band’s second album There’s Nothing Wrong With Love that same year, and then included on Live—“Car” is like a miniature version of what the band excels at. Starting out twee and dreamy, the song develops depth and punch when the drums kick in; and while Martsch’s voice maintains more or less the same mellifluousness throughout, his focus changes. Early on, he’s weighing the practical considerations and the exciting potential of a night out. By the end, when he’s singing, “I want to see movies of my dreams,” he’s turned his eyes from the mundane to the cosmic, as he so often does. The opening track on Perfect From Now On sets the tone for the entire LP with its billowing guitars and languid pace, while Martsch’s lyrics give the record its title and its sense of scope. After a well-articulated analogy for eternity—imagining it as far longer than the time it’d take for a feather-stroke to wear down an enormous metal sphere—Martsch asks listeners how they’re going to spend the afterlife, before insisting he’s going to be perfect, “starting now.” The line’s both funny and haunting, as is a lot of Perfect From Now On, an album that cycles through frank self-examination and petty gripes about humanity, in between instrumental passages at once more freeform and more intricate than any Built To Spill had attempted before. Easily the prettiest song on Keep It Like A Secret (though “Else” is in the running), “Temporarily Blind” sounds at first like Martsch had been just noodling away on his guitar, before someone pushed “record” and the rest of the band spontaneously joined in. But by the time Martsch starts singing that maybe everyone’s a little blind, the pieces snap into place and Built To Spill converts the song from a lilting half-ballad into something bouncier, with a martial rhythm. Martsch has said in the past that he doesn’t think too hard about his lyrics—some of which he outsources to his wife, Karena Youtz—aside from wanting to find words that have the right feel. But his music is peppered with memorable lines and thematic preoccupations. The Untethered Moon song “When I’m Blind” returns to the idea that “Temporarily Blind” expresses, dealing with what it means to be completely lost, and maybe better off for it. Built To Spill’s 1993 debut album Ultimate Alternative Wavers is a choppy collection, mostly consisting of thudding rockers, some of which are exciting but few of which have the structural integrity or rich textures of what was to come. What stands out more are the occasional spry pop-rock songs, like “Three Years Ago Today”—Martsch’s first real classic. Besides featuring an charmingly off-kilter arrangement—with small bursts of rocking-out between stretches of more muted picking and strumming—the song gets into what’ll be recurring Built To Spill subject matter when it raises questions about what it means to be a good person, and how to change and improve. One of the main reasons that Warner Bros. courted Built To Spill—and why bands like Modest Mouse and Death Cab For Cutie paid close attention to what BTS was doing—was because of unclassifiable wonders like this song, the opening track on There’s Nothing Wrong With Love. Like “The Plan” six years later, “In The Morning” opens with a bit of pomp and fanfare (reflecting how it is when people wake up “feelin’ half-right”), then keeps coming up with something new to explore, including an ending that’s at once slower and more violent than the way everything begins. And because the whole process only takes two-and-a-half minutes, the listener barely has time to adjust to what Martsch is doing before he’s leapt ahead. Former Treepeople member Pat Brown died in 1999, which inspired this belated tribute from There Is No Enemy, featuring Treepeople frontman (and Brown’s brother) Scott Schmaljohn. Part reminiscence and part benediction, “Pat” calls back to Martsch and Schmaljohn’s punk roots, delivering two minutes and 40 seconds of youthful, raging energy that makes a strange but apt complement to the reflective, wizened words. When Martsh sings, “Pat we know you fucked up / But we don’t care you fucked up / Everybody’s fucked up,” it softens the usual moralism of a Built To Spill song, valuing hard-bitten experience over purity. If “Carry The Zero” didn’t exist, “Temporarily Blind” would be Keep It Like A Secret’s crowning achievement—but then if “Carry The Zero” didn’t exist, a lot of songs would be in the running for the title of Built To Spill’s best. Instead, this is the one that gets put into the vault: just under six minutes of indie-rock bliss, highlighting everything that’s won Built To Spill so many fans over the decades. Martsch’s vocals, so seemingly offhanded, support a lyric that’s initially cryptic but then reverts to the more critical mode of earlier albums. “You’re so occupied with what other persons are occupied with,” Martsch sings, as what had been a snappy number with bouncy, faintly exotic overtones begins to intensify. Then the coda kicks in: guitars working in tandem, exploring one pattern and then moving on to another, and sometimes going up a key in the process. The only real knock against “Carry The Zero” is that it fades out before the band’s really done, though in a way that’s part of the song’s mystique. It’s fun to imagine a version that never ends, but just keeps evolving and rising. Perfect From Now On’s closer completes the thought begun in “Randy Described Eternity,” delivering another second-person lecture/warning, which includes the line, “Can you feel the darkness shining through? What are you gonna do?” (echoing the “Where will you spend eternity?” in “Randy”). “Untrustable” also rounds out Perfect From Now On musically. After seven tracks that sound like a fusion of spacey Americana and ’70s prog-rock—all cobbled together from cool-sounding song-fragments—the finale mostly holds to two parts, the latter of which settles comfortably into a groove and stays there for a while, in no apparent hurry to finish. As guest musicians John McMahon and Robert Roth add shadings of cello and mellotron, Martsch and company keep approaching what seems like it’s going to be the end, only to continue chugging past. “Untrustable” eventually does wrap, decisively, with the band working into a quick frenzy and then slamming on the brakes. The song lasts as long as it has to last, until it reaches the moment when Perfect From Now On can end perfectly.